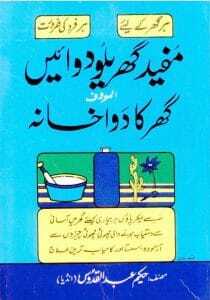 Mofeed Gharelo Dawaein by famous Indian Hakeem Abdul Quddos is a book in urdu language It is a great informative Urdu Book on health and fitness related issues. In Pakistan health treatment is very expensive and out of the reach of many people as a result health problem increase in our country day by day. The solution of this critical situation is to create awareness among the people to adopt the right lifestyle to avoid medication. In this book you can read homemade medicinal recipes, herbal medicines. Homemade medicines have a lot of advantages over other medicines available in medical store, herbal medicines have own worth all over the world. Many people in the world prefer herbal medicines to save themselves from chemical medicines as herbal treatment is natural and it contain weeds, fruits and oils etc they have no side effects so people love to use herbal medicines to treate diabetes, cough, loose motion, stomach diseases etc. Hakeem Abdul Quddoos has a lot of experience of herbal medicines, he writes many books on herbal medicines. In this book Hakeem Abdul Quddoos has given importance to natural method of treatment in the light of his vast experience. This book is very helpful to all people who want home treatment of healthcare problems. I am just helping the readers with information and article of authors. I am not hosting any books or literary material at all. I am providing only quality links to bestseller Urdu books, magazines and other literary material in PDF Format for the education purpose by the kindness of writers and distributors. Kindly buy the printed copy of it to admire the writer. All rights of publications are reserved to publisher of magazine or books. If any author has any issue to sharing their books for education purpose please connects me to remove provided link of magazine or book. The suggestion of authors is highly appreciated and I will immediately remove the provided link in my website. How to Download Mofeed Gharelo Dawaein by Hakeem Abdul Quddoos PDF Book.